Home > Post Office Savings > Small savings rates Cuts by 0.1% for between July 1 and September 30, 2017..! Small savings rates Cuts by 0.1% for between July 1 and September 30, 2017..! 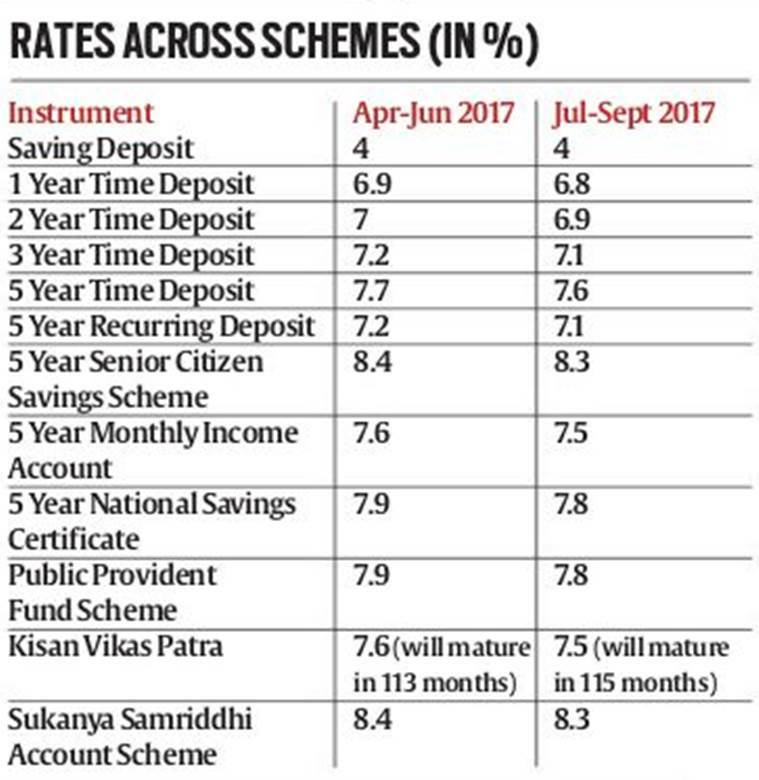 In a big blow to small investors, the Finance Ministry has further slashed the interest rates on small saving schemes such as the Public Provident Fund (PPF) and the Kisan Vikas Patra (KVP) by 0.1% (10 basis points). The new rates, notified by the Ministry on June 30, 2017, will be effective for the second quarter of the fiscal, between July 1 and September 30, 2017. Accordingly, the PPF will offer a return of 7.8% as against 7.9% in the first quarter of the fiscal. The immensely popular PPF yielded a return as high as 8.7% till 2015-16. The government had in April 2016 moved to a quarterly reset of small saving rates and linked them to the yield on government securities in order to help improve the transmission of monetary policy by banks. At that time, the return on the PPF was slashed to 8.1%. For the second quarter of 2017-18, the Sukanya Samriddhi Yojana and the 5 Year Senior Citizens Savings Scheme will continue to offer the highest return among all small savings: 8.3%, as against 8.4% in the first quarter. The KVP, which will now mature in 115 months against the earlier 113 months, will have an interest of 7.5%. The interest rate on the savings deposit scheme has, however, been retained at 4%. Pointing to higher liquidity over the last eight months following demonetisation, analysts said the relative stickiness in small savings rates has not hindered a fall in banks’ deposit rates, unlike in previous phases of tighter liquidity. “Given the continuing and substantial liquidity surplus, liquidity management measures and rate action by the RBI are likely to emerge as the key drivers of deposit rate cuts in the ongoing year,” said Mr. Aditi Nayar, Principal Economist, ICRA. Changes in the small savings rates will help in policy transmission when liquidity moves closer to neutrality, she added.